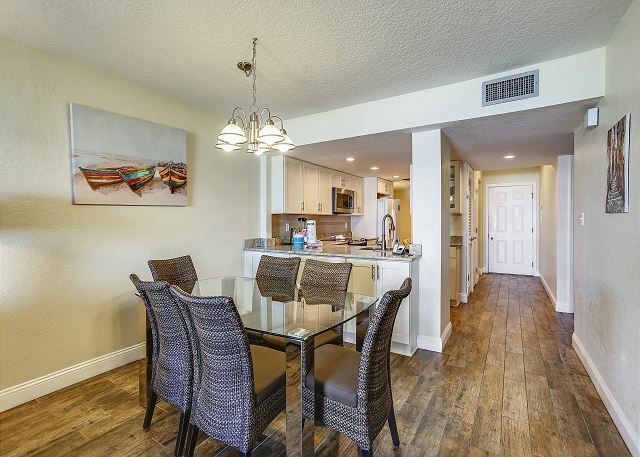 This recently remodeled third floor Gulf front condo has all the comforts of home. 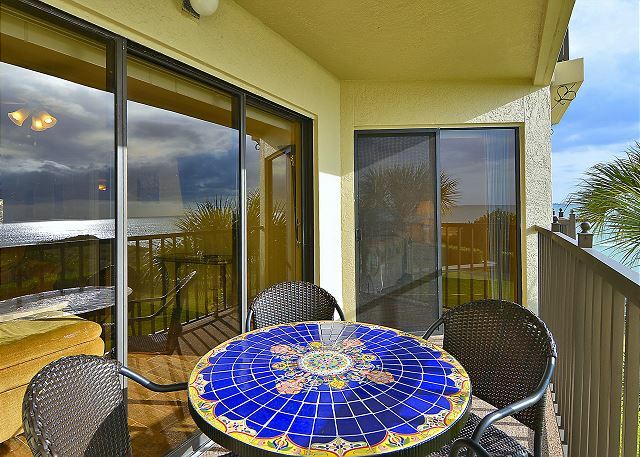 Plus a fantastic view of the beach and the Gulf of Mexico. 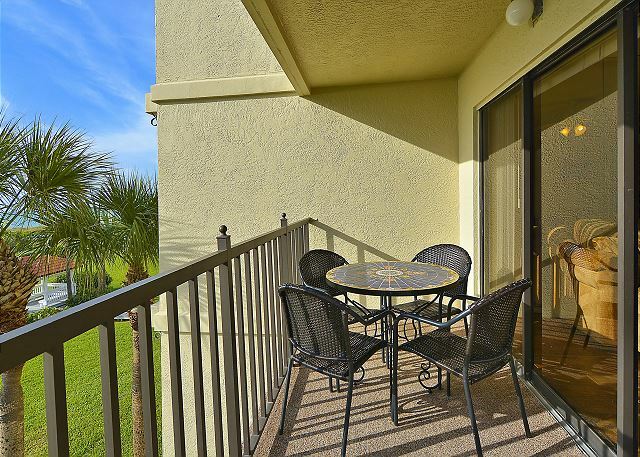 The sunset views are spectacular fro your private balcony! 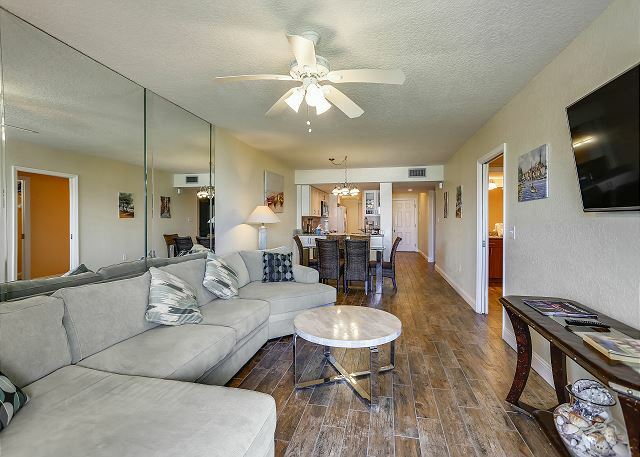 You will enjoy the comfortable living room furniture, brand new kitchen and bathrooms and tile throughout the unit. 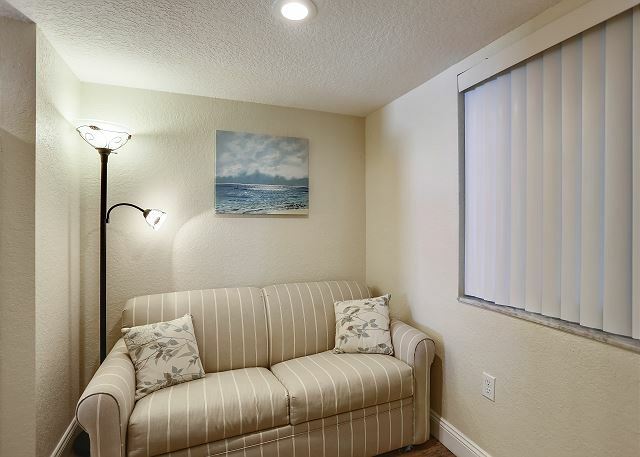 Enjoy 3 flat screen TV's as well as free wireless internet service and your own washer and dryer. We've already rebooked for next year! Great stay, a few upgrades and it would be spectacular. The "King Size" bed was actually 2 twin mattresses put together with a big crack (separation) between them. Unable to sleep on the middle of the bed and was uncomfortable for my wife and I. The living room screen does not cover the sliding door opening. The correct screen needs to be installed. Kitchen could use more cookware. A fitness center would be a great amenity to Lands End. All else was done well. Thank you for your feedback from your recent stay at Land's End, we will be sure to take a look at the items you have listed and thank you for letting us know. Please do not hesitate to contact us at our office if you are missing any kitchen items as we do keep supplies here that we are happy to get your way so that you are comfortable during your stay. Unfortunately a fitness center was not something that Land's End put in back when they developed the community so we do apologize that piece was missing. Glad to hear all else was good for your stay and we hope to see you back for another visit soon! This is the second time we have stayed at Lands End and rented through Resort Realty. We will be back, and next time, it will be longer than a week! We loved the condo. Updated, clean and comfortable. Great location on ocean side. Hope to be able to rent same unit next year. We have come every year and never regret the location, accommodations, and local restaurants. Never feels like a crowd at Lands End and many things to keep family busy on-premise. Great in every way. Awesome to hear!!! We are so glad you enjoy your time at Land's End and look forward to your next visit back! Love this property - clean, secure, quiet, ammenities and of course the beach! Awesome, so glad the community and this beachfront condo were a good fit for you!! :-) Thank you for choosing to stay with us and we hope to see you back for a future visit!! We had a great time here. The beach is amazing. The pool is huge with lots of chairs. Other residents of condo very friendly. Condo itself was nice as well. Very clean. The area is great as well. Tons of great restaurants. The only thing bad I can say is we couldn't figure out how to turn on the shower! Lol. If you rent this condo, pull the handle out. Overall, we had a great time. We are so sorry if it gave you any troubles!!! Glad you figured it out though! But, never hesitate to call us if you need any help with anything, that is what we are here for!! :-) Thank you so much for staying with us and we hope to see you back for another beach getaway soon!!! I’ve been coming to Land’s End Since the 80’s when I was in elementary School. I am now bringing my son, and neighbors while our kids are in elementary school. It is as clean and nice as it was from my youth, and has been updated through the years to keep it modern. We love it here, and I love knowing my son with have the same great memories I did as a child! Lands End is lovely and the apartment spacious and well equipped although a hair dryer would have been useful. Disappointed that some people were ignoring the pool rules and were reserving furniture at 8am every day and were not told to stop. Enjoyed lovely meals at Don Cesar. Thank you for this post and feedback! We too are sorry to hear about others not abiding by the rules....never hesitate to tell the staff on grounds if you have any problems with that, they are there to help! :-) Unfortunately hair dryers are one item that seems to go missing quite often from the condos as most do have them. If you do not find one upon your next visit with us, please do not hesitate to contact us at our office as we do keep a supply here that we are happy to lend out to you for the duration of your stay. Thank you for being our guest and we hope to see you back at Land's End for another vacation in the near future!! Our stay at this Land's end condo was very pleasant and relaxing. 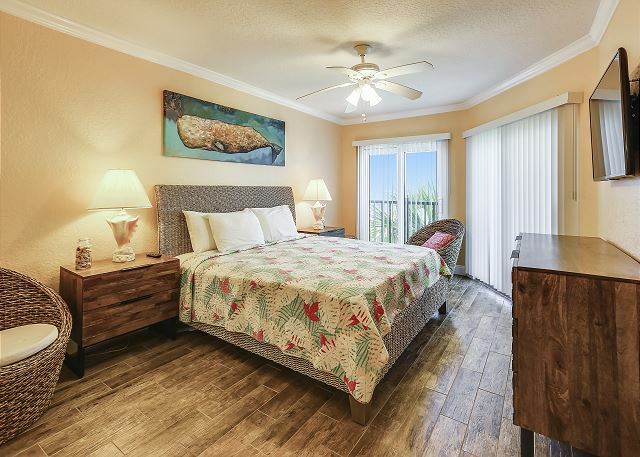 The unit is very clean and has an excellent ocean view. It is just what we were looking for to spend a nice week with the family. 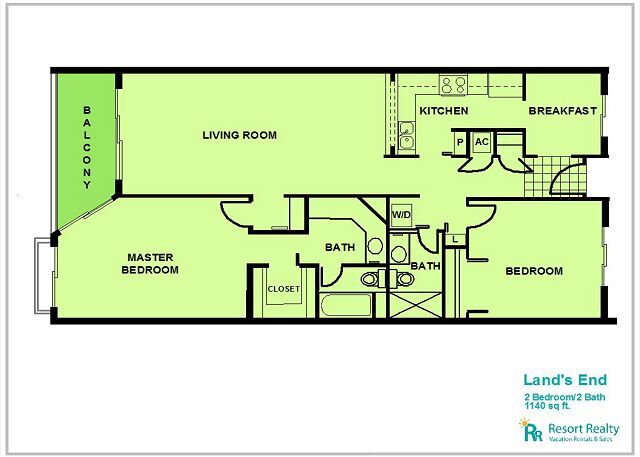 We are so glad this premier condo in our inventory was a good fit for you and your family while you visited Land's End!! 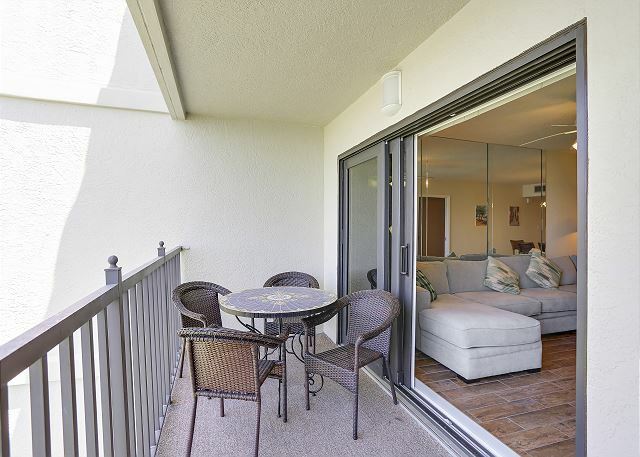 It really is a lovely, updated unit with AWESOME views just like you said!!! :-) Thank you so much for choosing to stay with us and we hope to have you back for another visit soon. 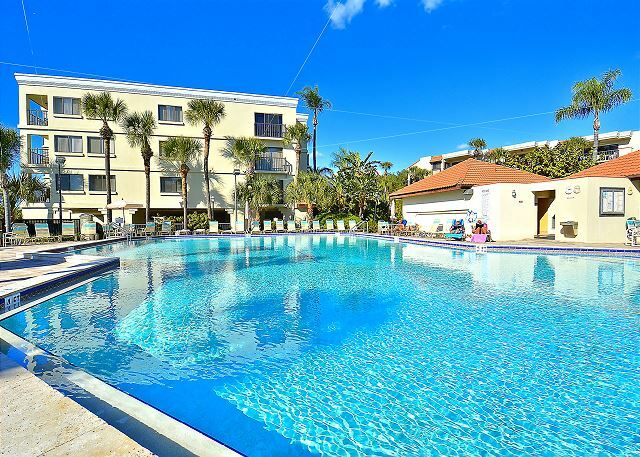 Lands End is a lovely and well kept complex with a lovely pool and beach. This is our second time to this condo and we love it here, its so relaxing and peaceful, just being able to watch the dolphins from the balcony is amazing. The condo has everything you need, we will certainly be back in the future. You feel like you are a private island. Peaceful, clean and safe. 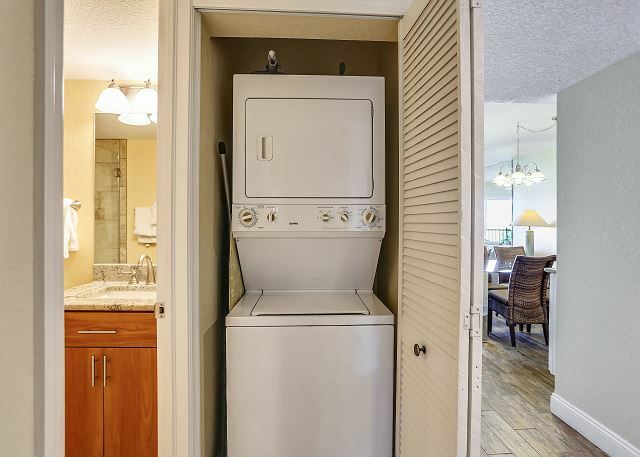 This condo is close to anything you need. Bathrooms are great!!! Beautiful view!! Saw dolphins right from the beach several times. Saw stingrays. Love the boardwalk and saw a manatee one day!! Fishing from the boardwalk,beach and rocks. Only small consI have is the beds were uncomfortable. Locks need to be changed to key code!! Need to upgrade mattresses but that would not stop me from renting this condo. One covered parking spot right at elevator!! Steps from beach sidewalk. Secret to lock issue is turn key as far to the left as possible then back to the right as far as possible!! Thanks for the post! 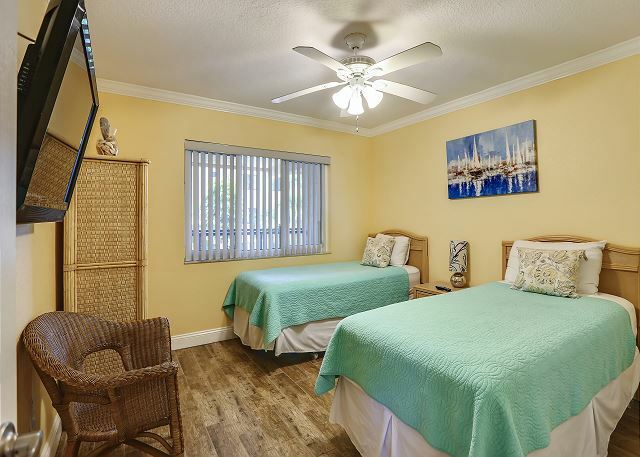 We are sorry if the bedding in this condo was not a good fit for you, we do understand that everyone's preferences in that department do vary but we have passed the feedback onto the owner for review. We LOVE that you saw all of the AWESOME FL wildlife that is here! It's absolutely amazing, isn't it?!??! :-) And yes, some of the locks at that location are a bit tricky but we are glad you figured out the secret to them!! Thank you for being our guest and we hope to see you back to this lovely area again. Our family loves the Lands End complex. 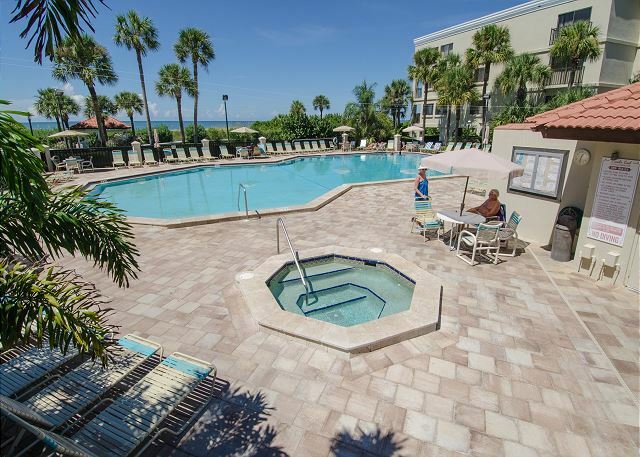 We enjoy the privacy of the complex while still being able to get to the surrounding tourist areas. Thanks for the post! We are so happy to hear that you enjoy the Land's End property, it really is a great location on an awesome stretch of beach!! :-) Thank you for being our guest and we look forward to your next stay with us! This is a great location as it is at the South end of Treasure Island. Traffic was light and the beach was very peaceful if that's what you are looking for. Close to anywhere that one might wanna venture out for the day. The condo was very clean and had everything that was needed for the week. The pool area was nice but very busy during the day. They could almost use another but we were also there during a very busy time. So glad you enjoyed!! 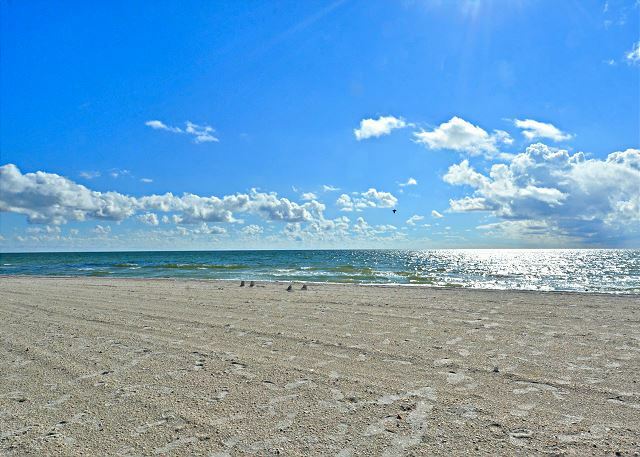 October is a BEAUTIFUL time on our beaches.......weather is great, beaches are less crowded and the rental prices are lower!! :-) We look forward to your next visit! Desiring a quiet and relaxing week is what we experienced at Land's End. 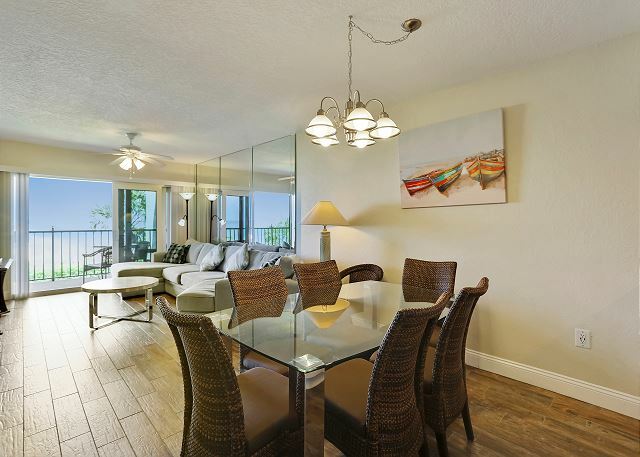 Awesome views from this condo #303/building 6 of the bay and ocean as depicted in the photos. We enjoyed walks on the boardwalk and beach each day and were amazed at the number of seashells on the beach & the beautiful sunsets. 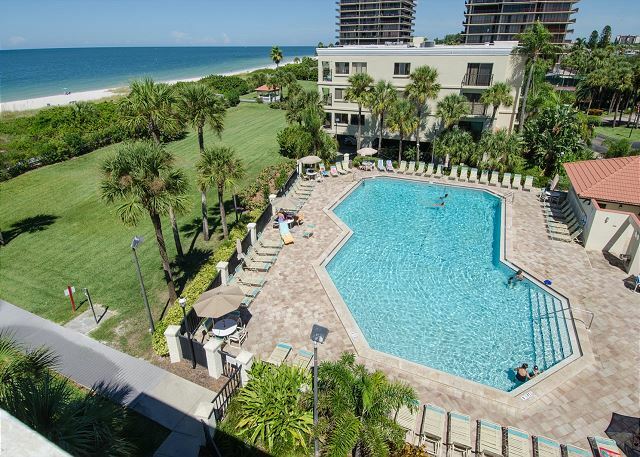 Good location as a base for exploring surrounding areas such as St Petersburg, Tampa, Longboat Key and Clearwater. 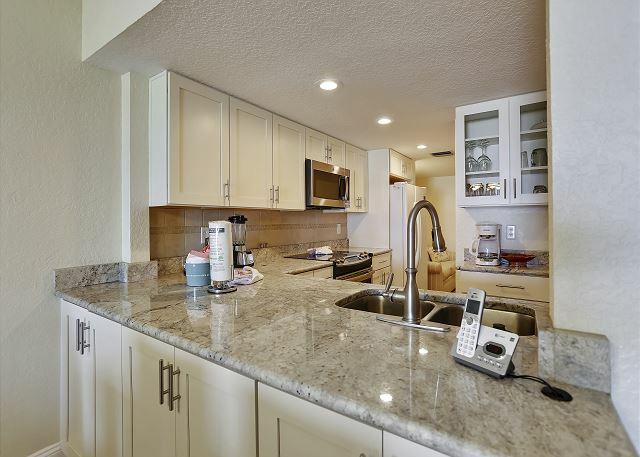 Condo was nicely decorated with comfortable sofa, updated Kitchen and Bathrooms. Master Bedroom mattress was rather firm and frame was very noisy getting in & out of bed. Overall we would definitely recommend this property and would book again in the future. Thank you for the post! We are so glad you enjoyed this premier condo and the Land's End community, it really is so pretty!!! Thank you for being a guest with us and we hope to have you back again soon! A last minute booking on our part, but a very enjoyable and relaxing experience at Lands End. The location of this Appartement is realy beautiful. Directly on the wonderful beach with his white sand a d clear water. The location was quit and pefect for relaxing. Not far away by car you can find cool bars and everything what you need to shop. We enjoyed our vacation there very much. I had business in the area, so I brought my wife for some relaxation while I worked. She thoroughly enjoyed being on the beach, and near the channel where the dolphins and manatees and shore birds like to come and go. Nice view, clean, well furnished, quiet... a bit on the pricey side but overall worth it. Stayed for a week on a whim in early January, will be back. It was a good condo. Kitchen was the only room that was somewhat updated. The rest of the furniture was old and stained. It didn't have travel size soaps, shampoos or dish washing liquid in the kitchen. There wasn't a blow dryer in the unit. I expected more from this unit. During our stay they were taking measurements so maybe next year it will be better. Thank you for your review. 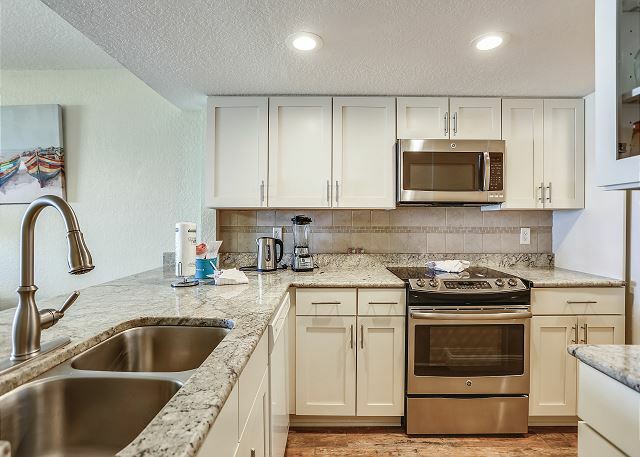 We do supply a starter package in each condo that consists of 2 rolls of toilet paper per bathroom, 2 hand soaps per bathroom, 1 roll of paper towels, 1 single load packet of dishwasher soap, 1 single load packet of laundry detergent and trash bags in each waste basket. Unfortunately shampoo and dish soap are two items that did not make the list. I will pass it on as a suggestion though. Thanks again and we hope to see you again next year. Unit needs a bit of updating. Love the location and building 6. Two maintenance calls unannounced. Will bring own beach furniture in future, umbrella non functional. Screen door was ripped and slat on the floor when arrived. Other than that-great stay. We arrived late, around midnight and the lock on the door was jammed. We called for assistance and promptly got a call back. We did manage to get the door open, my husband pushed a button on the door itself once opened and we had no further problems. Beyond that, we had a great experience. The condo layout was very accommodating for our family of 5, with 3 teenagers. Everyone had a place to have some space and there were plenty of TV's if more than one person wanted to watch. The kitchen was well appointed, we cooked several times and found all we needed. We loved the beach. It was very clean and family oriented with lots of space to play on the beach area as well as swim. Having a washer and dryer was very convenient for swim gear. We will certainly be back! Third time at this spot. This vacation was amazing. This was our third time at Lands End, and we love it. 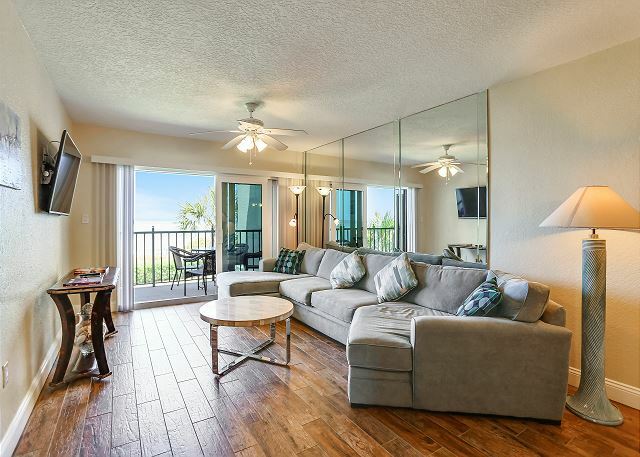 Our condo was on the gulf side and the views of the gulf and beach are spectacular! It is quiet and out of the way of traffic noise, but very convenient to shopping or excursions of you choose to venture away. Property lives up to its' name Lands End since it is truly at the end of Sunset Beach. It is out of the way, and very private. 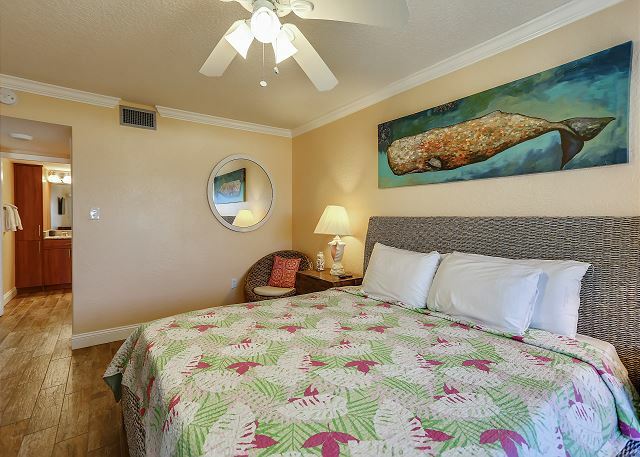 Property is well maintained, and very beautiful, condos are always clean and beautifully decorated. Nice kitchen if you enjoy cooking which we did more of this trip since we now have children. Resort rentals management and staff are wonderful as well. They are friendly and easy to work with. We are looking forward to our next vacation there! Fantastic week in an uncrowded area of Treasure Island. The complex was very well run, clean and accommodating. The condo was in good shape and had nearly everything we needed. Condo - 8.5 - needs some updating. Bathrooms are tired. New bedding/blankets would be nice. L/R TV was not good and needed replacement. Mgmt Co said it was addressed after we left. Thanks again for your review. We appreciate you taking the time to let us know what you liked about your stay as well as suggestions on what could be improved. We did take your suggestion and replaced the living room TV! Next time please don't hesitate to let us know if something is broken or inoperable. We have no problem revisiting a property to make things right! Condo unit was everything I expected. Master bedroom and California King was great. View from bedroom and living room was perfect. Great Price. Beach was beautiful. The pass was a nice addition with the boat traffic. Fishing from the property excellent. Definitely will stay again. Lovely condo that we would rent again. A few minor improvements would make it perfect but they did not detract from the experience. The main concern was the living room tv. It is on it's last legs and the ghost images made us use the bedroom tvs to view football etc. We enjoyed our stay. Thanks for your review. Sorry about the issues with the TV. I have passed the information on to the appropriate department to look into the situation. In the future if anything is not up to par, please let us know. We have no problem revisiting a property to make things right. We look forward to seeing you again next year. Beautiful location for relaxing in the sun. The condo was perfect to capture sunsets or catch a quick nap. The grounds of the complex is beautiful and well kept. Have already booked my return visit! Lands End #303 Building 6 - Beach Front Delivered As Promised! The Unit was clean, well maintained and had everthing that they promised! The Check In/ Check Out process was easy and frindly with no problems or hassles! My family of 4 had plenty of room, enjoyed a wonderful beach and pool, the grounds were well kept! The Internet and cable tv and all appliances worked well! The staff was extremely friendly and couteous. I have already recommended this property to my friends and relatives. My Florida relatives liked the accomodations as well! We are already planning to visit again next summer! There were several things missing from the condo. No trash cans in bathroom and bedroom, blender,towel bar in shower, the sofa seemed very old and in need of cleaning. Other than that it was a great place to stay. Overall experience was good. Furniture needs updating and TV didn't work well. 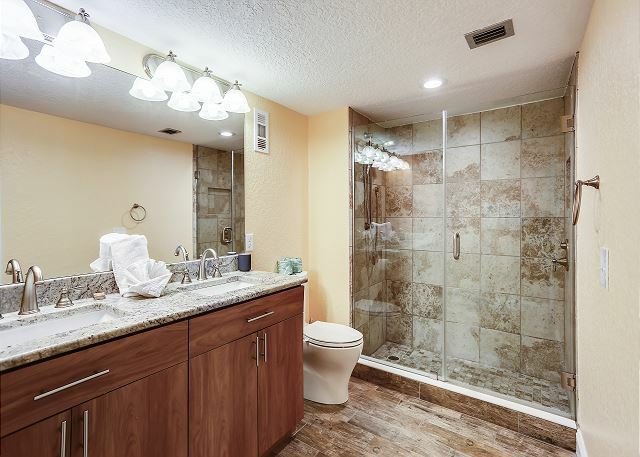 Very nice setting, professional property management, excellent location. Love the location and the privacy. Best on Treasure Island!! Second time here and will keep coming back. Enjoyed our stay at Land's End Condo on the beach. Only concern was that the living room couch needs to be cleaned. Gum stain on one of the cushions, and the couch in general looks like it needs a good cleaning or just needs to be replaced. We had great weather during our stay. The condo was in the perfect location. The only complaint that I would have is not enough pots and pans. The bed in master bedroom was not comfortable, but overall a clean and roomy condo. 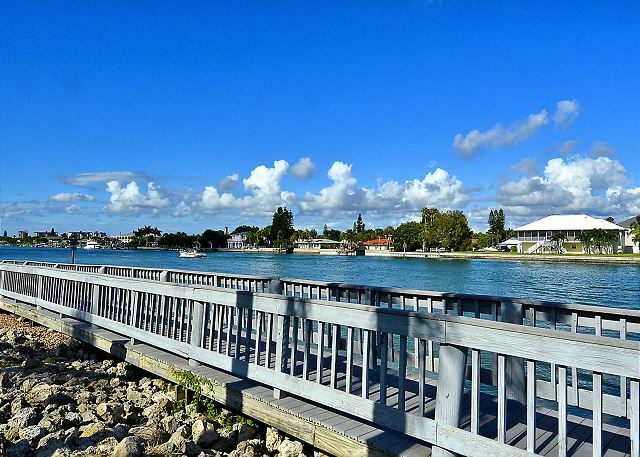 Great location, view, private beach and all the amenities. Everyone was exceptionally nice, especially the R&R staff. We arrived in town and stopped by the office to see if by chance we could check-in early, it happens that we were able to! Beach, shells, dolphins, it was beautiful. Lovely property and well maintained. 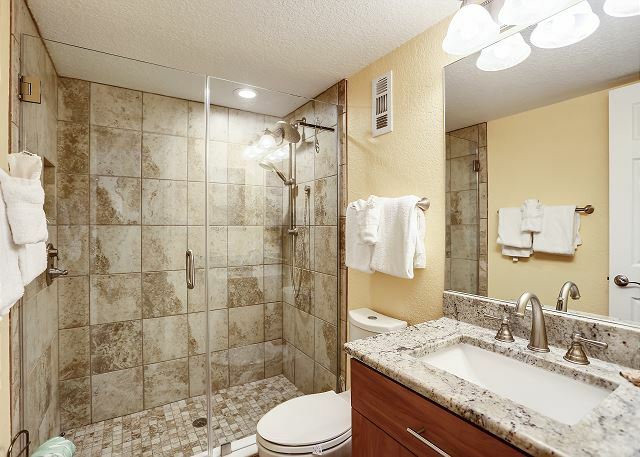 We did have a few minor glitches such as sliding glass door handle broke off, disposal failed to work, and the bathtub faucet had to be replaced. Maintenance was responsive and fixed all items. 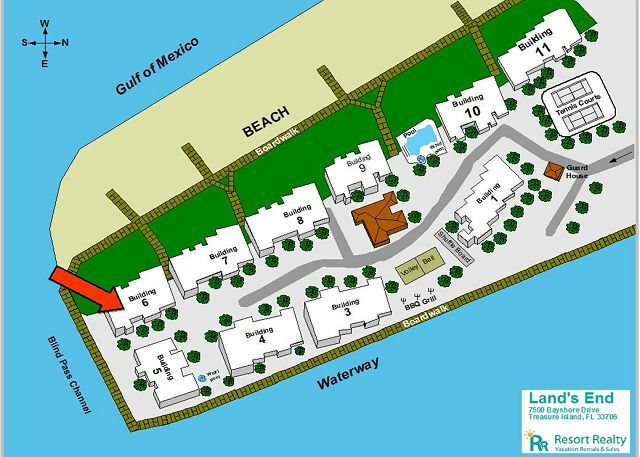 We especially enjoyed the privacy of the beach and incredible views of the Gulf. Thank you for a delightful vacation. All the beds were very hard and uncomfortable. There was not enough bath towels for 6 people. We have stayed here 4 times now and hope to stay many more. It can't be beat. The pool rules are too strict. Specifically not being able to throw anything. I heard of another individual who got scolded for having a beer in the hot tub. Families come with kids and kids like to play catch. If an individual buys a condo in a developement that allows weekly rentals they have to deal with kids throwing appropriate pool toys. Buy somewhere else if you want retirement rules. This was the best week ever at the beach. This unit was clean, up to date and cared for. It was exactly what we were looking for. Pool was nice and the beach was just a short stroll from the condo. Upon arrival the icemaker in the fridge would not work but with a little defrosting was working in no time. Only one drawback for this unit....one of the palm trees covered half of the view from the balcony. If it was trimmed it would have been much better. The complex grounds were immaculate. We would definitely stay here again. The shells we found at low tide were amazing. And the oil from the gulf that everyone feared?......didnt see a single oil ball. Great! We had 2 condos and 5 kids. 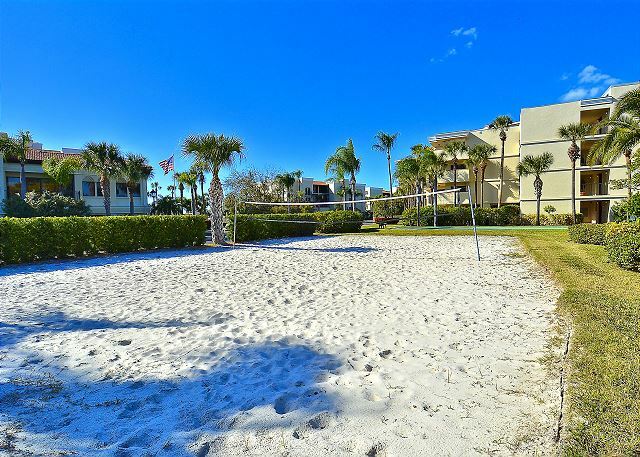 Easy beach access and pool, great boardwalk. I would highly recommend it to singles and families. Review - great location and apartment on site staff could be more cheerful.